Cattle Insurance Scheme: In India, many poor animals are dying every day due to many reasons. In fact, in India, there are also many religious rules and regulations due to which many poor and innocent animals get killed. These poor animals don’t need to die on regular basis. So the government has started a new scheme named as Cattle Insurance Scheme. We can hope that scheme will help those poor animals to save their life. In Cattle Insurance Scheme, Kerala government will provide insurance for these animals. In foreign countries, people love animals like their family members. But in India, there are many peoples who change this scenario. Also, at many places, these animals die to lack of proper treatment or due to lack of proper care. Sometimes the owner of these animals can’t afford to invest a big amount for these animals. So they let them die. But we should love animals. By loving animals means all animals. In India, people just love cats and dogs. But this is not a proper way. Love and respect animals as they also feel everything that we people can. What is Cattle Insurance Scheme? Cattle Insurance Scheme has been launched on 15th December 2016 in Kerala. 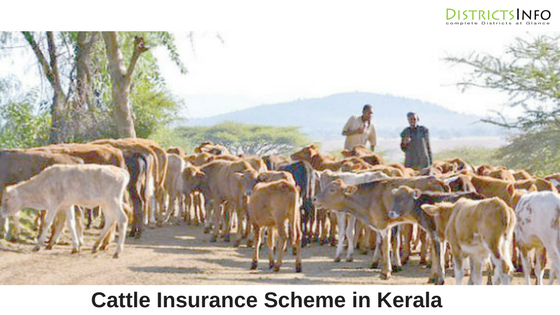 Under this scheme, Kerala government will provide insurance for different cattle like a cow, buffalo etc. Under Cattle Insurance Scheme government will provide insurance at a rate of 5.4% for 3 years and 2.4% for 1-year policy. So this is mainly for people to take a long policy. Subsidy of 50% will be provided by the government on Cow and Buffalo insurance plans. As poor farmers who somehow manages to feed their cattle and if someday these cattle die or stolen by someone, then these farmers almost lost their lives. As they have invested a lot of amount on their cattle’s feeding and proper care. Now they will be happy with this Cattle Insurance Scheme. • Cattle Insurance Scheme covers the following animals for this policy. • Animals with a specified age group are only allowed under this Cattle Insurance Scheme. • Market value of the animal will be insured as the sum under this policy. • The basic premium rate per annum is 4% of the sum insured. Long term policies can also be insured. • Group discounts are available. • For at least 1 year you need to have this policy. • Accident (Including fire, lightning, flood, storm, earthquake, cyclone, famine, and almost all the natural calamities). • Diseases occurred during the period of this policy. • Riot and Strike period also. If any harm is done to animals under Cattle Insurance Scheme. • Animals die during any surgical operation or any other disease. • Any identity proof like pan card, driving license, aadhar card etc. which will prove your presence in any village or city. • Address proof of your house. • Proposal form which you will get when applying for insurance under Cattle Insurance Scheme. • Veterinary health certificate from an established veterinary doctor explaining time, the cause of death, identification marks and other important things. In India, many people just do the show-off. They will have one dog or a cat, and they will keep them like their family members. And sometimes they forget their real family members. And for other animals, they behave like a cruel guy with no heart inside them. They throw stones even at other dogs. Love animals and take the benefit of Cattle Insurance Scheme.